sometimes I find myself in a running slump. my legs don't feel as fresh and I'm dreading starting a run. that's when I usually head over to the YMCA to run on the treadmill. mindless running is sometimes the key to get me out of a rut. yesterday I decided to try one of the running programs on the treadmill. I picked the "interval" option and set the initial speed to 6.0. I ran for 2 minutes at 0 incline, then ran for 2 minutes at an incline of 3.0, alternating the entire 30 minutes. Once I ran for 10 minutes I increased the speed to 6.3. After 20 minutes were up I increased the speed again to 6.5.
what I love about interval running is how much you really end up working. Although I wasn't running as fast as I usually do, I was still working up quite a sweat. I looked like a hot mess (literally) when we left the gym. I'm sure the people at Target really enjoyed me walking around in their store looking like that. once we were home and showered Ryan and I headed to Moosehead Grill for some wings. We heard they were the best in town and decided to give them a shot. Along with our wings we ordered the BBQ nachos. 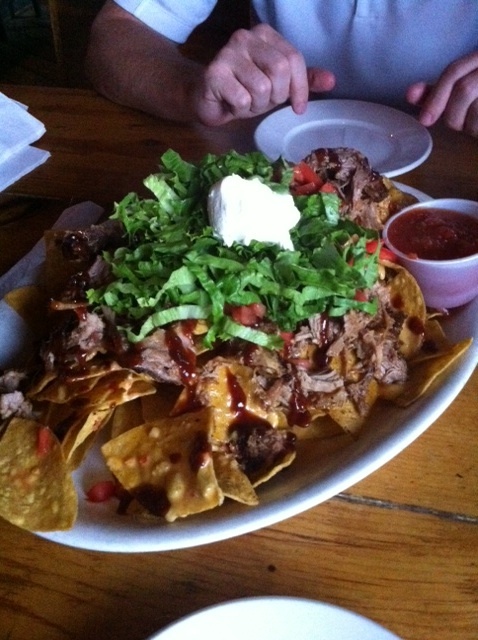 Holy nachos! They were amazing ... such a huge portion and definitely too much for 2 people to share. Luckily we restrained ourselves after eating 3/4 of it to save room for the wings. The wings were really good (sorry no picture ... too messy) and the atmosphere of Moosehead was perfect. Such a chill laid back scene. Looking forward to eating many more wings there.